I've always liked zoos but these game parks in Kenya and Tanzania are like no zoo I've ever seen. Even the Wild Animal Park in San Diego, California doesn't come close. There's nothing like seeing hundreds of animals grazing in miles and miles of open land. God has created a beautiful world for us, and interesting and unique animals too. We've been to the Nairobi National Park 5 or 6 times, the Hell's Gate Park twice, the Nakuru National Park, Tsavo West National Park twice, the Masai Mara and a couple other smaller parks in Kenya and now we've been to the Ngorongoro Crater in Tanzania. It's not like we are here just on vacation. We definitely are here to serve a mission and not just to act like tourists. Everything we've done has not been at the expense of our missionary work, and like this trip to the Crater, has been tied into mission work. We wouldn't have come if Elder Torrie hadn't felt the need to train the Arusha branch clerk and president. So it's a nice perk for us! And it was nice to be with Elder & Sister Munson who haven't had the time to see a park since they arrived in January. By the way, Elder Munson has a really good camera and took some great pictures. I copied some of them but somehow I can't open them as they are in RAW format. Does anyone know how to open them? Elder Munson? And by the way again, I'm going to put a couple more videos on the Ngorongoro Lions post. Just found them. We could have sat for a very long time watching these zebras, wildebeests, buffalo and birds. Click to enlarge and you'll see a blue bird flying almost on top of a zebra (far left). You can also see the wall of the crater. 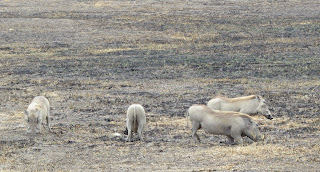 This is the dry season so the animals stick close to streams and ponds and lakes. Warthogs are so ugly, they're cute! Warthogs have very short thick necks so they have to kneel down to reach the food on the ground. Or maybe the warthog is kneeling for prayer (ha ha) . . . Our former president, President Hicken, said that the warthog should be our mission mascot because missionaries are also always kneeling in prayer. Buffalo, zebras, and wildebeests are congregating around a waterhole. You can see the side of the crater wall behind them. 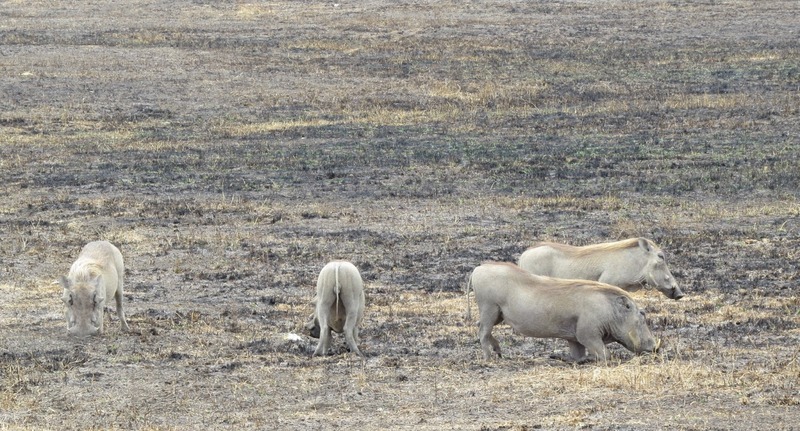 A buffalo, a hyena, and a heron (to the left in the grass). The crater is vast. In a day we weren't able to see it all. The crater floor is about 6000 ft above sea level. The top of the crater is almost 8000 ft above sea level which is why there were no mosquitos in our lodge. Vincent was an amazing guide. His English was good and his knowledge of the area great. We had wonderful conversations with him and I know he felt the spirit as we talked about life after death and God's plan for his children. It was a good experience. We have a son-in-law named Vincent too so that was a tie to our guide Vincent. The Torries and the Munsons in the Crater at one of the few spots where we can get out of the vehicle. There were hippos in the water keeping cool. We thought it was a bit chilly and LeRon got a sunburn on his head because he forgot to bring a hat. We enjoyed being with the Munsons. They were a fun couple. Wildebeests congregate with zebras because zebras have better eyesight and can warn of danger. Sadly, we only saw a couple of elephants from a very great distance. We had to really zoom in on this one. But wow, look at the size of that elephant. Apparently some of the largest elephants are here in the crater. So glad we got to see it, even if from a distance. Good view of a warthog on its knees. Its brain is about the size of a pea and they say that even as it heads somewhere, it will forget what it was going there for. Vincent, our guide, told us about this tree but I can't remember what he said. Maybe the Munsons will remember. We were taken with the gnarly bark on this tree. My lovely zebra!! Love the way the stripes go across the tail and across the behind and up the mane . . .
. . . and across the face and around the legs. The stripes fascinate me. Even though zebras kind of have donkey faces, I think they are lovely. Have I ever told you that? Controlled burns happen from time to time in different areas of the crater. It prevents fire and promotes new growth. We were amazed to see animals and birds in the burned areas. Ever since learning about hyenas when we were at the Masai Mara, I have found them interesting even though, granted, they are not the prettiest creatures. The hyenas here in the crater were particularly shaggy looking. And now to the wildebeests. Our guide Vincent pronounced it with a short "i" not a long "i" as most Westerners say it. At first I thought the wildebeest was another of God's ugly creations but the more we watched, the more they became interesting and almost cute! Most wildebeest in the Crater stay in the crater although they can leave if they want to climb up the steep slopes. But because they have food and water, they generally do not take part in "The Great Migration" of wildebeests and zebras that happens twice a year between the Serengeti and the Masai Mara. I find their stripes and beards quite fascinating. I tried and tried to see their eyes but I never could. I think they were covered with hair. No wonder their eyesight is poor. So ugly they're . . . well, not exactly cute!! It must be beautiful in the rainy season when the grass is green. But they say you can see more animals at this time of year -- and less tourists too. The Thomson gazelle is so graceful. Love the black stripes on each side. There are Grant's gazelles and Thomson's gazelles in the crater. No impala or topis. Still trying to see the wildebeest's eyes! Grant's gazelle on the left and Thomson's gazelle on the right. Grant's gazelles have a "MacDonald's" M on their rears. Three buffalo trying to hide from a predator! Not doing a great job of it. Red-billed Oxpecker pecking away at insects on this buffalo. Close-up of the red-billed oxpecker. Great picture of red-billed oxpeckers! Love those little birds. Oh oh . . . this buffalo didn't make it! I think this is a golden jackal. A black-backed jackal has a black saddle on its back. A side-striped jackal has a white tip on its tale. So this must be a golden jackal.